Make it an extra special birthday! 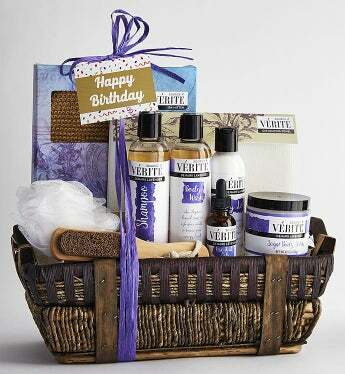 Send her an indulgent spa experience right at home with this exquisite spa gift basket featuring Source Vérité Denarii Lavender products. Known for its fresh floral aroma and naturally soothing properties, lavender has been used for relaxation and restoration since ancient times. With a sophisticated and subtle blend of sweet lavender with natural basil and rosemary, Denarii Lavender products are carefully crafted in the U.S.A. to nurture both body and spirit—so divine you may want to order one for yourself, too!